1) Indian Library Leaders- SRFLIS Life Time Achievements Award to be given to a very senior professional with distinguished caliber and work. 2) Indian Library Leaders- SRFLIS Award for Professional Excellence to be given to a senior who is known for her/his work. 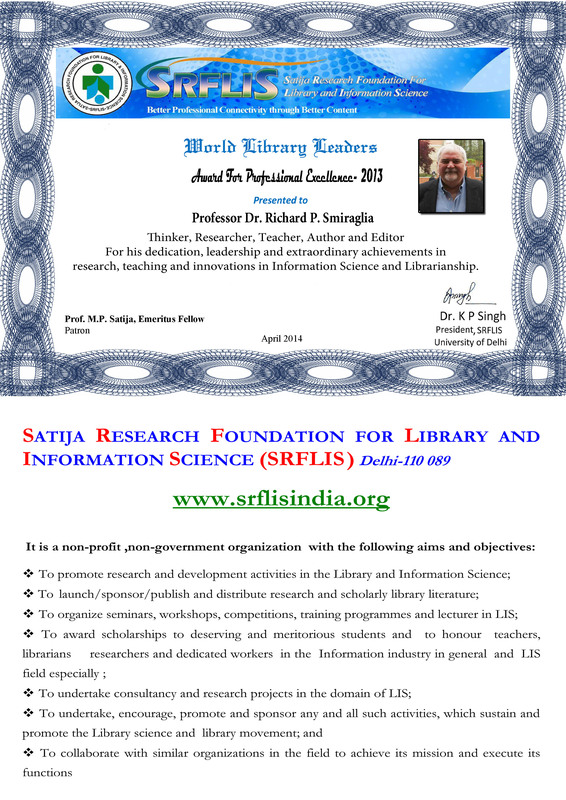 3 ) Indian Library Leaders- SRFLIS Promising Professional Award for a new horn who is dedicated to his professional work and has shown potential for excellence in the future work, Librarians, LIS teachers and Library scientists are eligible for all the three awards. At the time of superannuation of renowned Professor (Dr.) M P SATIJA on 30th June 2008 from the Department of Library & Information Science, Guru Nanak Dev University, Amritsar (Punjab). 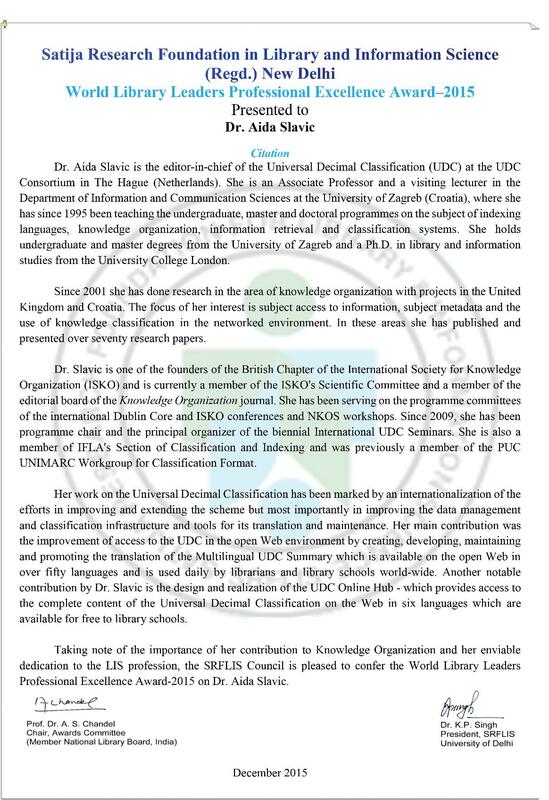 The admirers, students and the research scholars throughout the country and abroad comes together and decided to have a Research Foundation in his name and dedicate it to their great teacher to express their love, affection and devotion. To materialize this novel idea the senior LIS professionals who were the research scholars of Dr. Satija, namely Dr. Kunwar P Singh, Senior Assistant Professor & Principal Investigator, Department of Library and Information Science, University of Delhi, Delhi (India), Dr. Tariq Ahmad, Head Library Services, Beant Institute of Management & Technology, Gurudaspur (Punjab), Dr. Sarbinder Kaur, Librarian, Dr. B.R. Ambedkar National Institute of Technology (Deemed University), Jalandher (Punjab), Dr. Babita Sharma, Librarian, Govt. Degree College, Amritsar (Punjab), Dr. Kiran Kathuria, Assistant Professor, Department of Library and Information Science, Punjabi University, Patiala (Punjab)and many more has founded the said Research Foundation in honor of their great teacher, mentor and guide in the Month of January 2009 having its headquarters at Delhi. To collaborate with similar organizations in the field to achieve its mission and executive its functions.